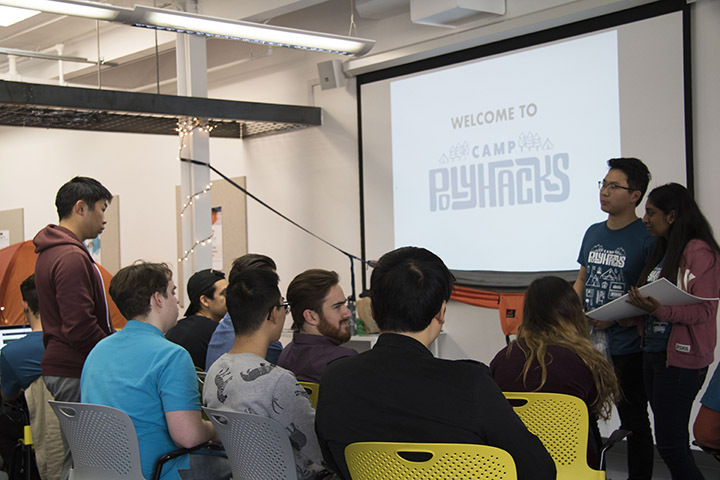 SAN LUIS OBISPO — Camp PolyHacks, an event where designers, developers, entrepreneurs and others build a fully functional product in 21 hours, took place Jan. 12-13. The social-entrepreneurship hackathon focused on creating solutions to four problems that face the San Luis Obispo community. “Camp PolyHacks is centered around doing good for the community — not just to differentiate it from other hackathons, but because I wanted to see these brilliant minds do more than just make another recipe app,” said Charmaine Farber, graphic communication professor and creative director for the Cal Poly Center for Innovation and Entrepreneurship. More than 100 Cal Poly students and 40 San Luis Obispo community members registered to participate in the event, which was held at the CIE’s HotHouse in downtown San Luis Obispo. “We try to allure people from several different backgrounds, so teams can leverage a variety of different strengths to creatively solve these real-world problems,” Farber said. The first problem was presented by Geoffrey Chiapella, senior transportation planner at San Luis Obispo Council of Governments. He tasked teams with developing a smart parking tool to maximize the use of public on-street parking and private off-street parking to negate the need for a major public investment in city-owned parking structures. Bryn Smith, planning and outreach specialist at Community Action Partnership of San Luis Obispo County, explained the need for a tool to assist parents seeking child care during non-traditional hours. David and Sean Askay, whose father lost his home in the Thomas Fire last year, explained the need for a way to inventory belongings destroyed by a disaster in order to submit them for an insurance claim. The final challenge regarded intelligent cities and the industrial Internet of Things. Jacqui Luis and Carolyn Ma of General Electric Digital asked teams to develop a way to optimize the data collected from General Electric Digital’s pre-existing assets to make San Luis Obispo a safer and more efficient community. After hearing the problems and a keynote speech by San Luis Obispo Mayor Heidi Harmon, participants formed teams and began brainstorming. They had from 8 a.m. to 8 p.m. the next day to build their products and develop their pitches. The first-place prize winning group, Neighborly, created a disaster-relief app that helps users easily identify objects in their homes for donating to people in their community. After interviewing potential users, the team found an app of this nature would be more effective than an insurance inventory one, and thus took an approach different from the original prompt. It helps identify the needs of the community and has an automated inventory system that uses augmented reality and computer vision. The team was made up of computer science majors Joe Wijoyo, Karen Kauffman, Shelby Chen and Mian Uddin; software engineering major Devin Nicholson; graphic communication majors Hanna Trejo and Cidney Lee; and business majors Ethan Turer and Tim Elkana. The second- and third-place teams both tackled the child care problem. Second place went to The Babysitter’s Club, comprised of graphic communication majors Jocelyn Tam, Daisy Jimenez, Emily Hoehenrieder, Katherine DeOsuna and Sarah Hughes; computer engineering majors Vinh Nguyen and Kenneth Huang; and economics majors Donald Moore. Swap Sitters came in third place, with team members including students and community members: graphic communication majors Erica Taylor, Ian Kaufman and Annika Miller; computer science major Alex Gravenor; and community members Mike Murgatroyd, Sarah Mostafa and Jeff Farber. The following Cal Poly students planned and organize Camp PolyHacks: graphic communication students Dorian Romero, Perry Ting, Jamie Chin, Javier Garcia, Diane Hahn; computer science students Rutu Samai and Nicole Hill; communication studies student Amy Rush; and architecture student Evan Ricaurté. Directors Perry Ting and Rutu Samai prep the Entrepreneurs for the business challenge, where they are tasked to go out and ask potential customers for feedback on their projects. 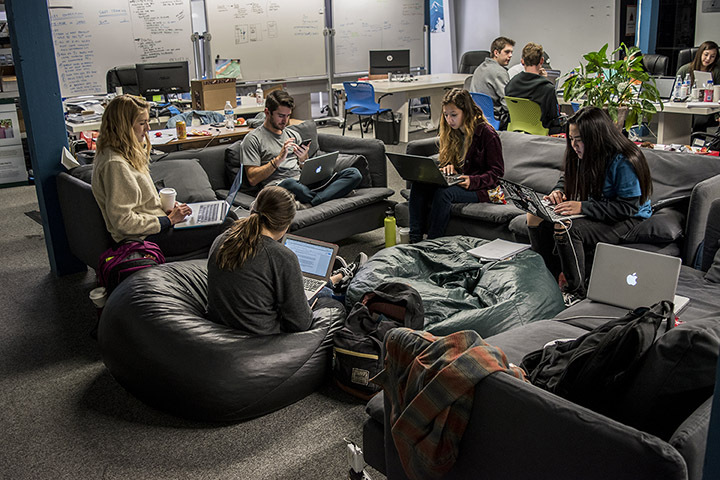 Campers take advantage of the HotHouse’s couches and beanbags to make their workspace comfortable.